With the FIVB World Championships just over a month away, U.S. Women’s National team head coach Karch Kiraly announced a preliminary 22-woman roster on Thursday. Paige Tapp (above) and Mallory McCage formed the best blocking tandem in the German Bundesliga last season. 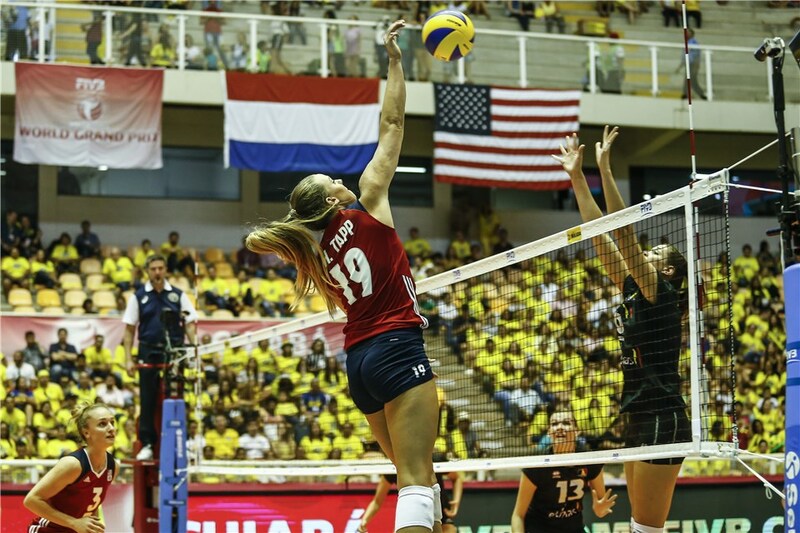 On Monday, Team USA released its initial 25-woman roster for the Pan American Cup, including three setters, four liberos, five opposites, six outside hitters and seven middle blockers. 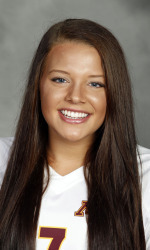 Hannah Tapp is a middle blocker from Stewartville, Minnesota. She stayed in state and joined the Golden Gophers in 2013. After her college career, Tapp moved to Germany to play professionally. Tapp played for the Stewartville Tigers in Minnesota where she was named to the first-team and all-state team both her junior and senior year. During her senior year, she committed to play for the Minnesota Golden Gophers. Tapp’s first year of college was a success as she was selected to Freshman All-Big Ten team. She also ranked second in blocks and blocks per set and was named in the preseason All-Big Ten team prior to her sophomore year. During her junior year, she was named in the First team AVCA All-American. Tapp started in all 35 matches and scored the second most points. The Golden Gophers won the Regional Final against Hawaii but ultimately lost the Semifinal to Texas. Tapp also represented Team USA when the Collegiate National Team competed in China Tour in June. To finish off her college career, Tapp was a AVCA Second Team All-American, Academic All-Big Ten and Academic All-District member and a top 10 finalist in Senior CLASS Award. She also helped the Golden Gophers to reach consecutive semi-final appearances during her last two years in college. Tapp made her international debut in 2016 with the Schweriner SC in Germany. After her first season, she made the move to Italy where she plays for A1 Firenze. Tapp had also represented Team USA when she was chosen to be apart of the 2017 FIVB Grand Prix roster. Tapp helped Team USA place fifth in the series.